I am amazed by how much my little man grows everyday. He has been such a joy to raise, even in the difficult times. As I witness this amazing growth (both mentally and physically), I am constantly looking for ways to challenge him. Not only does he get bored easily, he LOVES being hands on. He wants to help whenever he can and he always wants to be in right in the middle of the action. 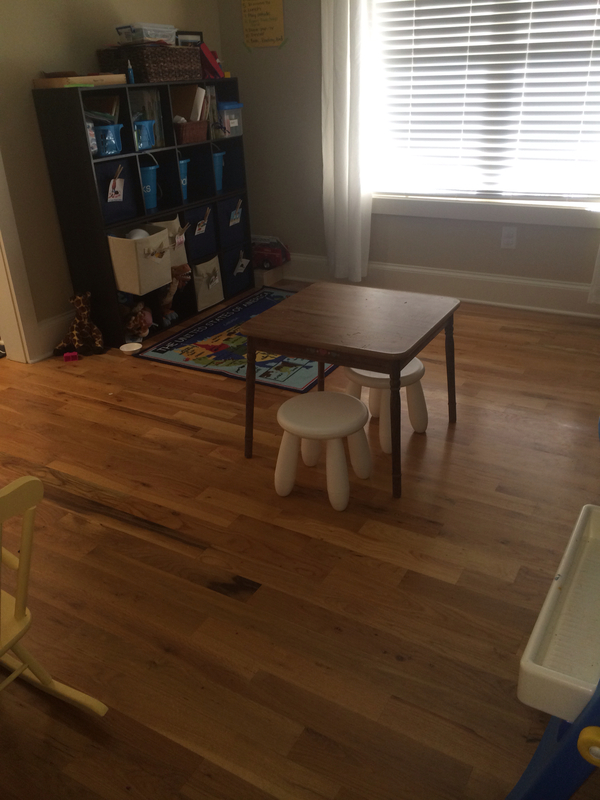 My husband and I determined that he was plenty old enough to start doing chores. Why not use his genuine curiosity to help with the function of our home? He's a member of the house and he is old enough to help it run smoothly. So without further ado, he's what he does. He turned 4 in December. 1. Puts away his laundry. While I sit in the middle of the hallway in the middle of a huge pile of laundry I make a pile for each member of the family. At this stage it's easy (baby girl clothes, boy clothes, husband clothes, my clothes, and house linens). As I sit there I make sure to do Luke's first. I fold his underwear, pjs, pants and match his socks. Then he comes and takes the piles to their respective locations. His dresser is in the closet and he knows what goes in each drawer. I put the hanging stuff in a separate pile and I do that later. It saves me about 10 minutes lugging stuff to his room and then putting it away. He loves this. And I love that he's REALLY helping. 2. 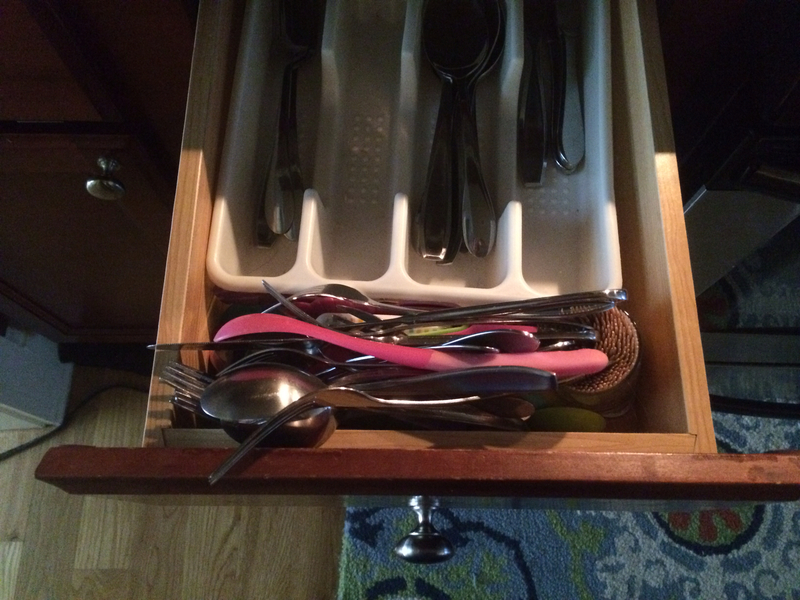 Sorts the utensil drawer. Everytime I unload the dishwasher I make him a nice pile of little forks, big forks, spoons, not sharp knives, and baby utensils. 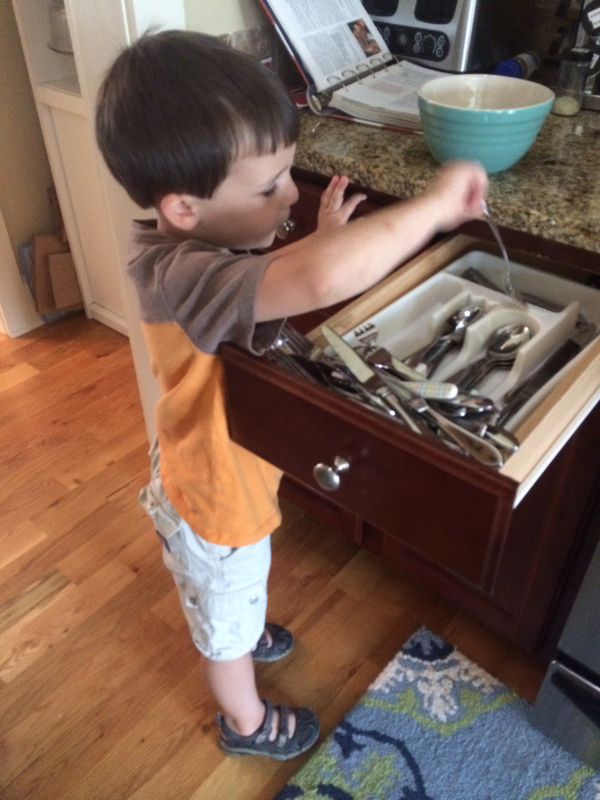 They are in a huge pile and he stands at the silverware drawer and sorts them. Oh and of course I make him wash his hands before! He LOVES it when dishes are clean. He LOVES when I unload the dishwasher because it's something that he can do, and it's something he does well. There are times I've caught him using a fork to flick a ball around the living room, but he's 4. He's going to get distracted. And you can be assured those forks end up back in the sink. 3. Picking up toys. Oh for the love of everything holy, please do not pick up your child's toys! He has been doing this for over 2 years. It doesn't hurt that he has his father's OCD clean genes. He loves when things look clean. Every night before bed his toys must be picked up and put away in the correct place. Of course if he's working on something (Lincoln Log village or his train tracks) he can leave those out. But little pieces of things that don't go to anything get put away. Food from their kitchen gets put away. And anything that doesn't get picked up goes in time out for the next day. Of course there have been nights where fits have been thrown. Other nights we get home late. I have to make it a priority that I help remind him before he gets overtired. I want to set him up to be successful. We try to have everything picked up BEFORE dinner. Then after dinner we snuggle, read, occasionally watch TV and take baths. If we wait until 8pm to start picking up it usually ends in a disastrous screaming, crying, toy throwing event. And do the piles get picked up EVERY night? No. But I'd say 5 of 7 nights they do. Not too bad. When I cook, I usually go ahead and fill the plates before they are on the table. I've found that we dirty more dishes when I bring a bowl of green beans to the table. Why not serve straight out of the stove pot? This makes an assembly line on the counters and typically once plates are filled I like to get them on the table. I usually call Luke in and have him take plates to the table. Has he ever dropped one? No. Will he? Most likely. It'll be ok. In the time when I don't have anything for him to carry he sets out the utensils and napkins and carries condiments to the table. I like knowing that when we sit down to dinner that we all had a hand in making dinner a success. 5. Feed the dog. As much as I've tried to ban him from opening doors, he has figured out how to get around the child locks. He hits them with his fist and they pop off the doorknobs into 2 pieces. SO I put his genius to work. Now that he can open the back door his morning chore is to feed Sadie. He gets her cup, pulls the top off the big galvanized can, digs it in and pours it in her bowl. He loves this. Also since he can reach the water dispenser in the fridge I let him fill her water bowl. I'm sure there will be accidents, but NOTHING teaches him as much responsibility than to care for other members of our family. He did leave the top off of Sadie's food the other day and it rained but he learned a valuable lesson! 6. Take down recycling. 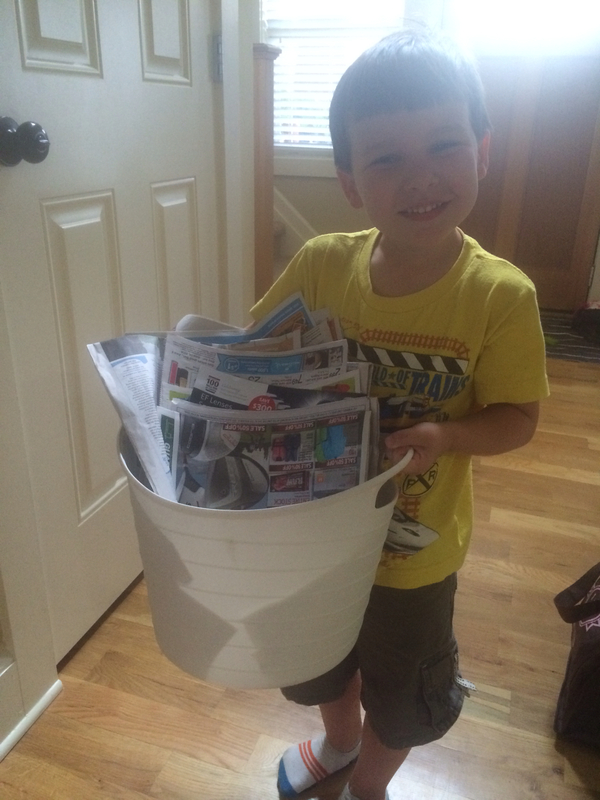 We try our best to recycle paper, cardboard, glass, and plastic. Back when we didn't pay for trash pickup and we could drop it free we only had about 1 bag a week since paper, cardboard, plastic and glass took up SO MUCH SPACE in the trash. By streamlining our garbage it was amazing to see how quick we as Americans are to throw stuff away. Now that we have trash pickup at home, we still only have about 3 bags a week (and that includes my sewing trash, some diapers- we do cloth diaper about 80% of the time, and regular household trash). 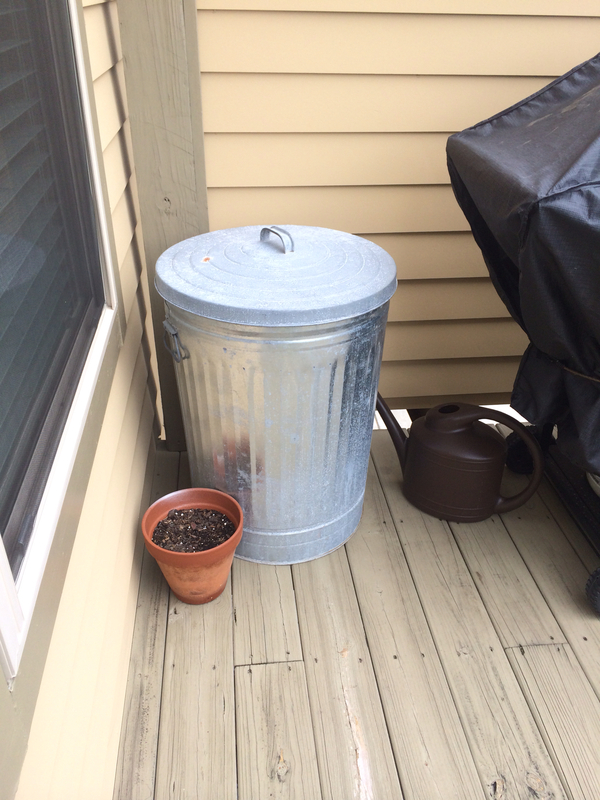 We keep a small container right next to our trash and when it's full Luke takes it down stairs to sort. We have 2 white containers for paper and plastic and then 2 smaller black containers for cardboard and glass. Cardboard usually takes the most space so we sometimes end up stacking it on top if it gets out of control. When those containers are full we lug it all to our local recycling bins in town. My point in telling you this? Luke empties the white container whenever it's full. He takes it down to the garage and sorts it in the correct pile because we've taught him where it goes. I love to challenging him with chores. He's not allowed to say I can't. And he can't pull the "PLEASSSSE help me clean my mess" gig. I nipped that a long time ago. I also like to give him chores that I have to teach him how to do. He goes from having no idea how to do something to being completely proud of himself for finishing the task. It's an amazing morale booster. I taught kids that wanted me to do everything for them (I'm not talking helping them with work- I'm talking about picking up pencils, jackets, and cups for them off the floor). Good thing for 2 of those years I was very pregnant and couldn't bend over anyways. I remember quite a few times the phrase "I'm not your momma and I'm definitely not your maid" slipping out of my mouth. This is a life skill that will benefit them all throughout life! I'm also looking to add more as he gets older like dusting the baseboards (which he can probably already do), putting the vacuum away, cleaning his bathroom counter, etc. But for now I am very proud of what he does to help!